Comment There was a refresh release of Spectrum Scale earlier in November, and the ability of IBM to keep on pushing improvements into the scalable enterprise storage solution is impressive and underlines the task facing startups such as Rozo in building new scale-out file systems. It also underlines how Spectrum Scale will not simply fall over and die because Softlayer has bought Cleversafe. GUI has extensions so that common administrative tasks, including policy setting, can be all run without needing a single instance of the command line. The GUI has a dashboard showing what is happening in the cluster, the connections to the clients and the trends. If you have two clusters, some IBM storage then Spectrum Control will provide end-to-end visibility and trending. Drop-in use cases for proof-of-concept testing of HBase, Hadoop or Big Insights. Spectrum Scale's HDFS (Hadoop File System) transparency means you can just point the application at it and it runs, with no lock-in since no app modification is necessary. Spectrum Scale has natively supported Swift and Amazon S3 protocols, not gateways, so you can combine object and file storage, for leading performance and true file interoperability. Faster data access using local disk or flash for write caching to complement the existing read caching. There is also policy-driven compression, which could result in savings on cache space, meaning more data can effectively sit in cache and speed things up. 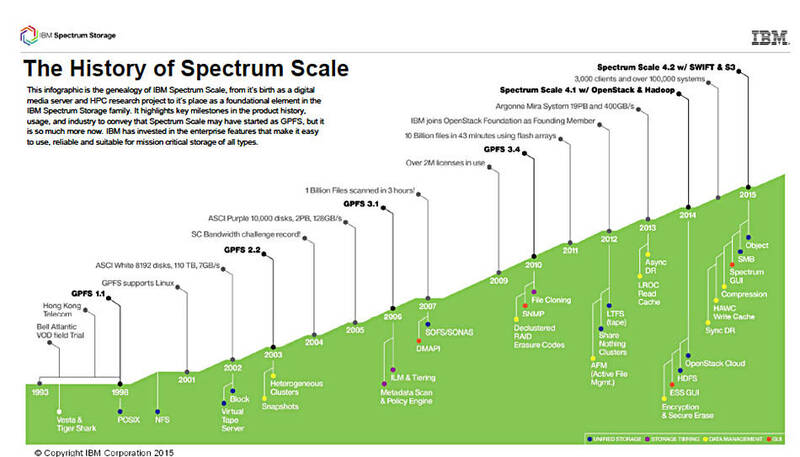 Spectrum Scale history chart. Click chart for larger version. Our understanding is that IBM paid up to half a billion dollars for Cleversafe, with extra payments if performance targets are met over the next few months. IBM, meaning Softlayer, originally wanted to buy Amplidata but a $130m bid was exceeded, with HGST paying up to $300m for the object storage startup.